European captain Jose Maria Olazabal. Picture Stuart Adams www.golftourimages.com:Jose Maria Olazabal insists that Graeme McDowell is one of the main men in Chicago. Even American Jim Furyk agrees that G-Mac has “ice in his veins” after witnessing his Celtic Manor heroics and there’s no better man to defuse Davis Love’s masterplan to win back the Ryder Cup. “Well, he’s one of our main men, to be honest,” Olazabal said. “He loves this competition. I think this competition brings the best in him to be honest. He’s a very gutsy player. Doesn’t matter if he’s not striking the ball well. He will fight until the very end. He will fight for every shot, for every inch. And we saw that in the past. “You know, he was at Celtic Manor, for instance. He was last in that single matches on Monday, and I have to say that he was a little down on himself on Sunday night. McDowell is convinced that abuse of Europeans - eight of who now live in the US - will be minimal. But he knows that Love wants to stir the 40,000-strong Chicago crowd into a frenzy with birdies and eagles and the only way to counteract that will be by playing great golf. Excited to make his third Ryder Cup appearance, McDowell said: “There’s no doubt, there’s a world of difference between playing in front of your home fans and playing in front of the US fans. “Putts that drop in front of your home fans are like a bomb going off and putts that go in this weekend will be like someone’s got the silencer on. It’s kind of a muted applause. McDowell made his Ryder Cup debut on US soil in Kentucky four years ago, when Paul Azinger’s warriors hammered a European squad that virtually leaderless with the hapless Nick Faldo at the helm. 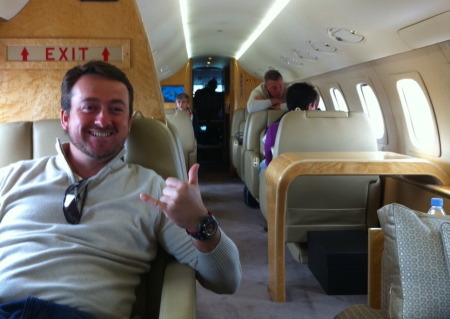 But while Lee Westwood endured some torrid abuse from fans, McDowell has nothing but happy memories. He loved the mano a mano challenge of matchplay and remembers nothing untoward from a beer fuelled crowd in Valhalla. Europe’s team now features seven PGA Tour members and eight of the side have homes in the US. The days when local DJs carried out “Wake the Enemy” campaigns appear to be long gone as far as McDowell is concerned. G-Mac said: “Davis is trying to get the crowd on his side as best he can, because there’s no doubt, as much golf as the Europeans play here in the States, I think the crowds like the European golfers. They have embraced them as PGA Tour players. “The days of hostility I think are gone. “Of course, the crowd are going to be on the Americans’ side, that’s inevitable, but the hostility has gone to a certain extent. “I think Davis wants birdies and eagles made to get the crowd fizzed up and charged up and make sure that they are 120 percent behind the guys. It’s going to be exciting and it’s going to be loud. While Europe has won six of the last eight Ryder Cup matches, McDowell reckons the infusion of new blood is going to make the Americans tougher to beat than ever. He said: “I really don’t think history counts for much coming in here this week. I think Europe have to be slight underdogs perhaps on paper. “I think the American team have got a lot more camaraderie on their side than they have ever had before. McDowell looks certain to partner Rory McIlroy again and European skipper reckons that the young Ulsterman could be one of his greatest weapons this week. Olazabal said: “ I would say that he is at this moment very close to how good Tiger was at that stretch of time between ‘99 and 2002, the way he’s playing. “He plays with a lot of heart and those are elements that are crucial and essential to this tournament, to this event,” the Spaniard said. The Americans know all too well what McDowell is capable of under pressure following his match winning heroics against Hunter Mahan in the final singles in 2010. Jim Furyk said: “The iron shot into 16, the putt that he made down the hill; I mean, Graeme has ice in his veins. He might need to reproduce it to silence those Chicago crowds this week. 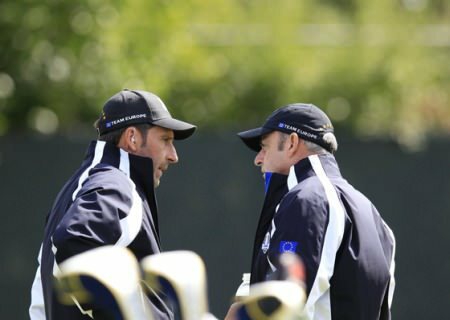 European Team Captain Jose Maria Olazabal (ESP) and Vice Captain Paul McGinley (IRL) on the 6th hole during Wednesday’s Practice Day of the 39th Ryder Cup at Medinah Country Club, Chicago, Illinois 26th September 2012 (Photo Eoin Clarke/www.golffile.ie)Ryder Cup vice-captain Paul McGinley insists that Europe won’t change their winning formula as they bid for a seventh win from the last nine matches. 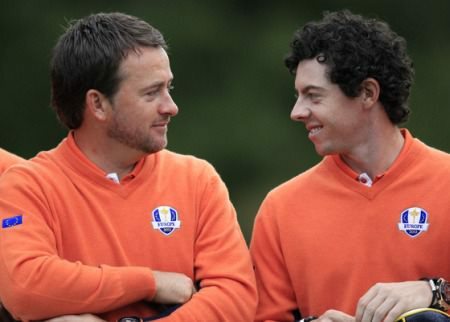 Graeme McDowell and Rory McIlroy are clearly Europe’s top two and will lead out the side at Medinah. Photo Eoin Clarke/www.golffile.ieYou wanted Rory McIlroy. Now get him if you can.